Margaret Cichoracki watched from her car Sunday night as a brown bear sow pushed over a trash can outside Eagle River High School. One of the three cubs climbed on top of the can and later, standing up on its hind legs, dragged it down the snowy sidewalk. It wasn't the bears' first time getting into garbage. In recent weeks, Eagle River residents like Cichoracki have posted photos and videos on social media of the brown bear family digging through garbage cans and, at least once, tipping over a dumpster. 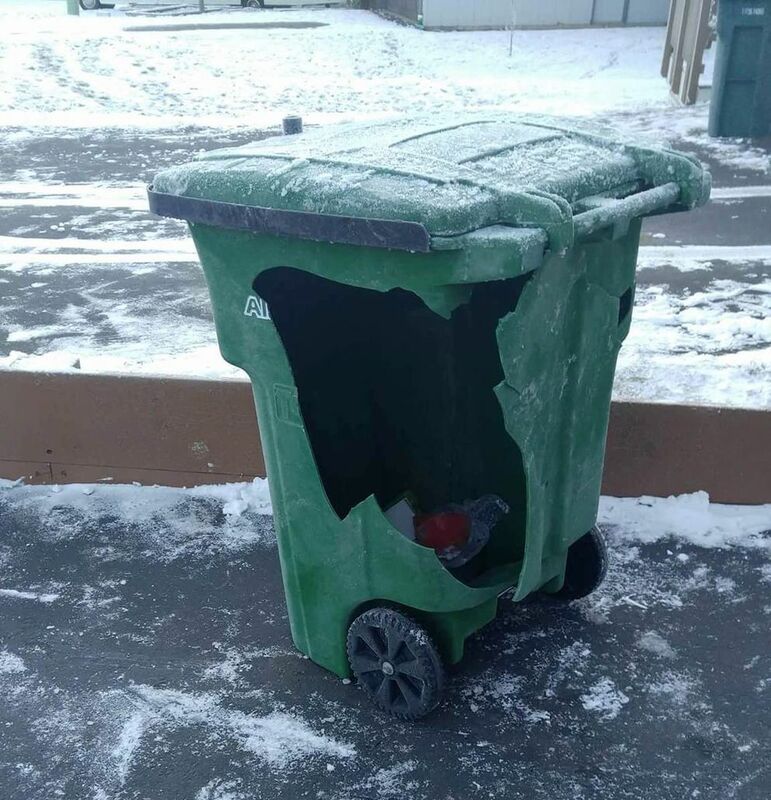 Mary Lock, who has lived in Eagle River for seven years, said the sow managed to bust open her bear-resistant trash can early Tuesday, and it didn't stop there. "She didn't just hit our trash can," Lock said. "She hit a couple down our street." Instead of raiding trash, the bears should be going into hibernation, said Ken Marsh, an Alaska Department of Fish and Game spokesman. But, he said, the bears won't hibernate if food remains available, including trash. On Tuesday, Eagle River High School sent out an advisory about the lingering brown bears. Marsh described the bears as a growing public safety concern. He said people had spotted them from the high school to West Parkview Terrace to Banff Springs Street. "We're monitoring the situation very closely with an eye toward possibly destroying the bears," he said. "It's getting to a point where public safety concerns are starting to rise." Marsh reiterated a familiar message from Fish and Game: "We need folks to really secure their trash." "I think we've been hoping — with our fingers crossed — that people would clean up their garbage and remove the food attractant so the bears don't have any reason to hang around and they'd go up in the hills to hibernate," Marsh said. "But that just hasn't happened." Marsh said Fish and Game forwarded a few trash concerns in Eagle River to wildlife troopers. He did not know if troopers had issued any citations in the cases. Troopers did not return requests for information Tuesday. If a bear is attracted to unsecured trash, the resident can receive a $310 fine, Marsh said. Marsh said brown bears can be aggressive when defending food sources, including trash, and people should avoid approaching them. He advised residents to store their garbage cans inside.